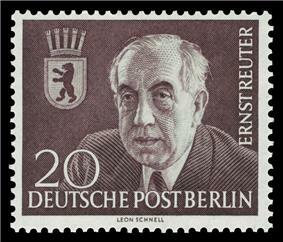 Ernst Reuter on a West Berlin postage stamp from 1954. Ernst Rudolf Johannes Reuter (29 July 1889 – 29 September 1953) was the German mayor of West Berlin from 1948 to 1953, during the time of the Cold War. Reuter was born in Apenrade (Aabenraa), Province of Schleswig-Holstein (now in Denmark). He spent his childhood days in Leer where a public square is named after him. Reuter attended the universities of Münster and Marburg where he completed his studies in 1912 and passed the examinations as a teacher. Moreover, he was member in a fraternity called "SBV Frankonia Marburg". The same year he became a member of the Social Democratic Party of Germany (SPD). Reuter opposed Kaiser Wilhelm's regime at the start of the Lenin sent him to Saratov in the to-be-established Volga German Autonomous Soviet Socialist Republic. Upon his return to Germany, Reuter joined the Communist Party of Germany (KPD) and was named the First Secretary of its Berlin section. He embraced a position on the left wing of the party endorsing an open rebellion in March 1921 in central Germany and placed himself hereby in opposition to the leader of the party, Paul Levi. Although Reuter was seen as a favorite of Lenin, he was expelled from the party in 1922. He moved briefly to the Independent Social Democratic Party of Germany (USPD), and then returned to the Social Democrats for good. In 1926, Reuter entered services in the government of Berlin and was responsible for transportation. Accomplishments were the foundation of the Berliner Verkehrsbetriebe (BVG), the introduction of a unified ticket for public transportation, and extensions of the Berlin subway system. From 1931 until 1933, Reuter was the mayor of Turkey in 1935 where he stayed until the end to the Nazi era. In Ankara he lectured at the University, introduced urban planning as a university discipline, and served as consultant to the Government. After the end of World War II, Reuter returned to Berlin, and was elected in 1946 to the Magistrat (governing body) where he oversaw initially the Transportation Department. In 1947 he was elected Lord Mayor (Oberbürgermeister) of Berlin but in the deepening crisis of the Cold War, the Soviet government withheld their necessary consent. Reuter is most notable for his stance during the Cold War in Berlin. During the Soviet-imposed Berlin Blockade (1948/49), the western part of city was sustained by the Berlin airlift that was established by the American Military Governor, Lucius D. Clay. In response to the threat, the citizens in the western sectors had to come together. Ernst Reuter became their spokesman and leader, a symbolic figure of the "Free Berlin". Memorable is Reuter’s speech in front of the burned-out Reichstag building on 9 September 1948, facing a crowd of 300,000 where he appealed to the world not to abandon Berlin. In the election that was conducted in the western part of Berlin two months later, his popularity gave the SPD the highest win with 64.5% ever achieved by any party in a free election in Germany. As mayor he formed a grand coalition government with the next two largest parties to demonstrate West Berlin’s unity. Reuter's appeal to the West did not go unheard. The airlift saved the city from starvation, and Reuter became only the second German postwar politician (after Konrad Adenauer) to be placed on the cover of Time Magazine. He was titled "Herr Berlin". When the new Berlin State Constitution became effective for West Berlin, Reuter was re-elected and on 18 January 1951, became what was now called the Governing Mayor (Regierender Bürgermeister) of West Berlin. He served in this function until his death. Under his aegis, the Free University of Berlin was founded, as the University of Berlin was in the Soviet sector and under communist rule. In 1953 Reuter established the "Bürgermeister-Reuter-Stiftung" (Mayor Reuter Foundation) to assist refugees coming to West-Berlin. A few weeks after the uprising of 17 June 1953 in East Berlin, Reuter died suddenly and unexpectedly from a heart attack in West Berlin at the age of 64. His funeral was attended by more than 1 million people. His grave is an Ehrengrab (honorary grave) on the Waldfriedhof Zehlendorf. Reuter was married in 1920, and he and his wife Lotte (Charlotte) had two children, Hella (1920–1983), and (Gerd Edzard) Harry (1921–1992) who became a British citizen and a professor of mathematics. Harry's son Timothy was a distinguished mediaeval historian. In 1927 Reuter divorced Charlotte and remarried. He and his second wife Hanna had one son, Edzard, who became the CEO of Daimler-Benz. Ernst-Reuter-Plakette (Ernst Reuter Medal): the highest award by the City of Berlin was established by the Senate of Berlin for persons whose work benefited the city in 1954. Ernst-Reuter-Gesellschaft (Ernst Reuter Association): a group of alumni and friends of the Free University of Berlin that was founded in 1954. The Association names the winners of the annual "Ernst-Reuter-Preis" for excellent dissertations from the university and provideds “Ernst-Reuter-Stipends” for studies abroad. Former places where Reuter lived received memorial plaques: Hardenbergstraße 35 (Berlin-Charlottenburg), and Bülowstraße 33 (Berlin-Zehlendorf). Other towns in Germany have streets or schools named after Ernst Reuter. The "Champion of Liberty" series issued by the United States Postal Service in 1959 honored Reuter with two stamps. Ernst Reuter: Rationalisierung der Berliner Verkehrsbedienung. Verkehrstechnik (29 June 1928) 9; 26:437-439. Ernst Reuter. Schriften - Reden. Hg. v. Hans E. Hirschfeld und Hans J. Reichardt. Vorwort von Willy Brandt. Bd. 1-4. Frankfurt am Main; Berlin; Wien 1972-1975. This article is based on the corresponding article in the German WorldHeritage from 10 May 2006. ^ Parrish, Thomas (1995). "Reuter, Ernst (1889-1953)". The Cold War Encyclopedia (1st ed.). New York: H. Holt. pp. 266–7. ^ Time (12 October 1953). "Herr Berlin". Retrieved 14 May 2009.